I guess my thing on this trip is getting a late start on the day - a benefit of traveling alone is that you decide your own schedule. After a shower (finally, a hotel that provides washcloths on this trip; the rooms have improved each time), I left the hotel at noon to go find a laundromat. My first attempt was a place I had seen on Google Maps (that was supposed to be) called Wash Studio - it was a little over a 1 km walk from the hotel. However, when I arrived at the site I found that it (and the rest of the building) had been demolished, and something fancy-looking was being built in its place. So I doubled back to the hotel (sweating pretty profusely by now) to ask the front desk for suggestions on where to go (I didn't want to pay the hotel's price-per-item rates for a full load). One of the desk clerks suggested that the nearest self-service place would be in Bukit Bintang. Taking his advice, I ordered an Uber to take me to Hello Laundry in that area. I was able to find the place and do my laundry without much issue. While my load dried, I walked over to the nearby Sungei Wang Plaza to find lunch. I settled on a place called Pak Hailam Kopitiam after one of the workers said that they could provide vegetarian options, though I didn't really see any on the menu. At his suggestion, I ordered the Curry Wantam Mee without the fish balls - it was kind of like a ramen with curry. The food was OK (and spicy), and the apple juice that I ordered to accompany it was nice and fresh. The service was quick (which I appreciated since I was in a hurry to get back to my laundry before the dryer timer expired), though that did mean that the food was hot when I got it. After lunch and returning to the laundromat to gather my clothes, I took the monorail from Bukit Bintang (MR6) to Bukit Nanas (MR8), and then walked back to the hotel. My laundered clothes were put away by 4:15pm, at which point I needed to decide how to spend the rest of the day. 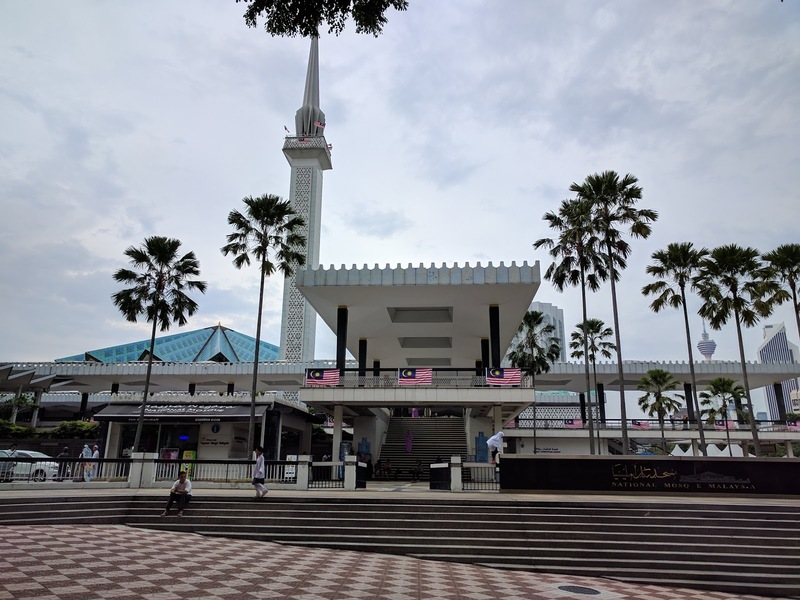 I headed downstairs about 15 minutes later, intending to go to either the National Museum or National Mosque (Masjid Negara). There was a light rain when I exited the hotel, but this didn't bother me too much, nor did it last terribly long. I took the Kelana Jaya train from Dang Wangi (KJ12) to KL Sentral (KJ15). There, I figured out why Google Maps had told me to take the Komuter train (Port Klang line in the direction of Tanjung Malim) back northeast to the Kuala Lumpur station - the streets around KL Sentral were pretty pedestrian-hostile. The walking situation didn't really improve much after I went back in and took the Google Maps suggestion to get to the KL station - it took me a while to find places where I could legally, or at least safely, cross a couple of main roads. 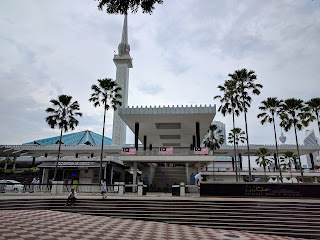 I did eventually make it to Masjid Negara, where I donned a robe, set aside my shoes, and then entered to look around for about 20-30 minutes. 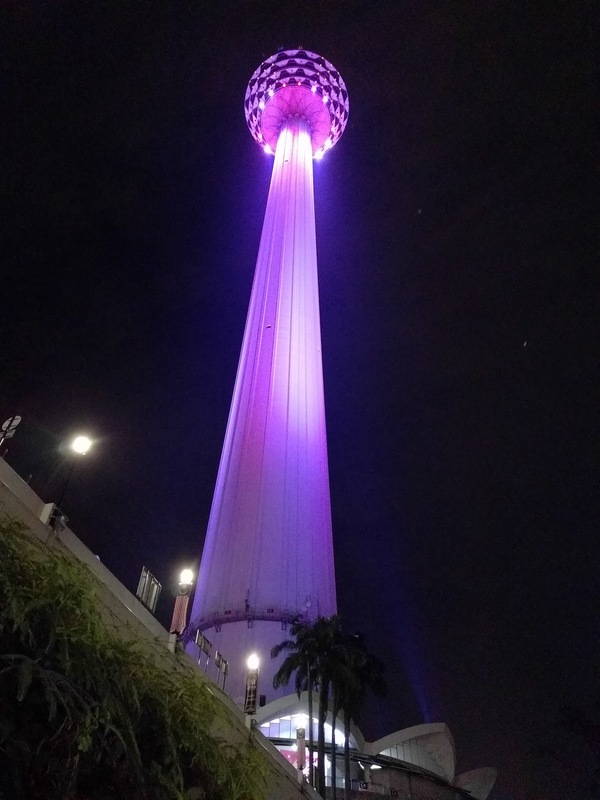 After the mosque I walked a ways over to Menara Kuala Lumpur (KL Tower). 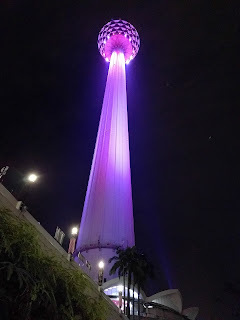 Despite the cooler temperatures that the rain had brought, I was still sweaty when I arrived at Menara KL. But the view from the Sky Deck was definitely worth it. I also took a bit of time after sunset to snack on kiwi cake and lychee juice at the Sky Cafe. After I was done admiring the view, I skipped the Observation Deck (the indoor viewing area a level below that is included with the Sky Deck purchase) and headed down to the ground. I didn't want to worry about finding food back around the hotel (even though there's a pretty big food court right across the street), so I got a small vegetarian pizza at Santino's Pizza in the complex at the base of the tower. After eating I headed back to the hotel on foot.